“I fell into my routines…after a while I felt in a state almost trance-like, not thinking about my hands or feet-just the ball. In my days as a club cricketer, I was lucky enough to play against some top overseas professionals. One massive run scorer in our league for many years was the West Indian, Clayton Lambert. Lamby often used to sing while he batted, but one day was very quiet. I said to him, “Lamby, you aren’t singing today” to which he replied “No man, I only sing when I ain’t got the bowler’s rhythm; today I got his rhythm!” Oh dear, here comes another ton, I thought!!! I sing when I don’t have the bowler’s rhythm; today I got his rhythm. Ed Cowan’s journey of self-discovery is an interesting one and in his book he describes how he adapted his method as he came up against different environments, such as faster and better bowling, different pitch conditions and about trying to adapt to different game forms. 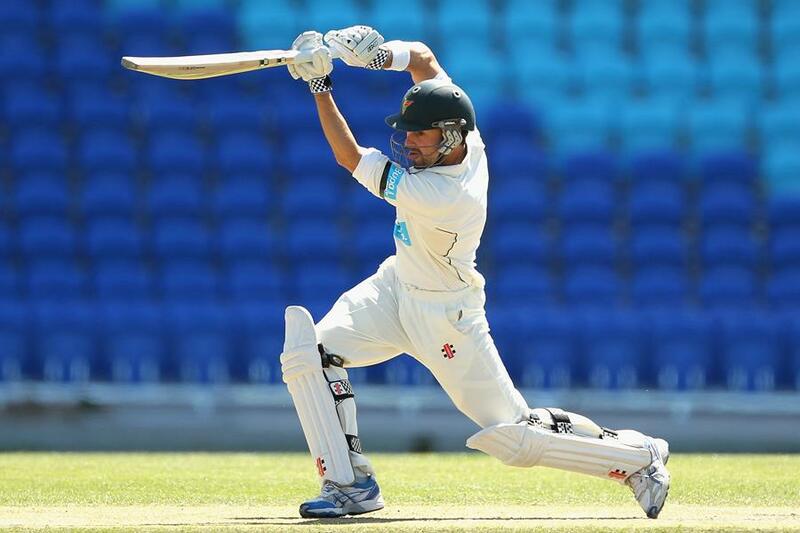 What is significant is that (at least for now) Cowan’s journey of self-discovery has led back to where it all started; by adopting the technique he had as a 20-year old ‘beginner’ just breaking into shield cricket. I started to tap the bat and pick it up only when it was required. Within ten minutes I felt like a bird released from its cage. The ball started to fly purely off the face of the willow as it is meant to – with little effort and an ease that only comes when your feet and hands are talking to each other like loving siblings. A shot of the top 15 Australian run scorers in Test and first-class cricket recently appeared on our change-room wall. 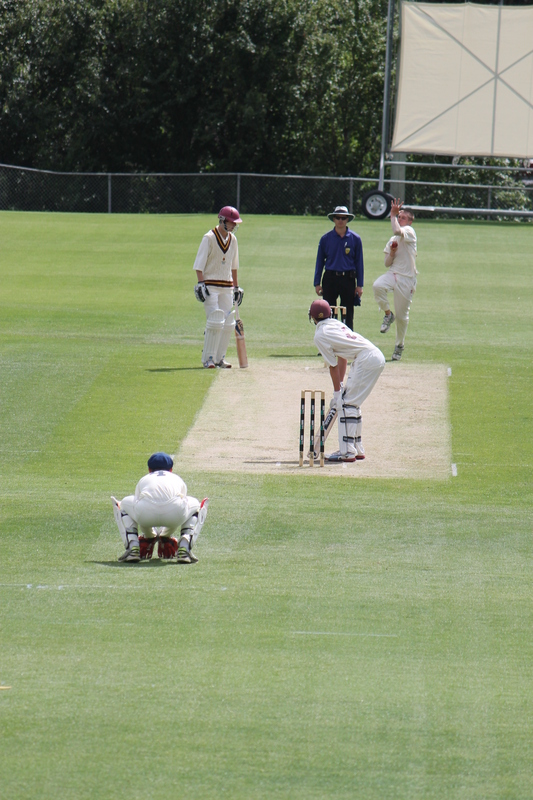 The photos were taken as the bowler was in his delivery stride. All but one batsman has his bat touching the ground. Admittedly most then move their bat upwards as the ball is leaving the hand, ready to pounce. While I strongly believe that there is no one right way to bat, standing still and ‘tapping’ has some big advantages and I would suggest coaches need to encouaraging young players to adopt this method and move away from the more limited ‘bat-up’ method that has only worked well for a few. Tapping the bat creates better rhythm in batting and allows the lower body and upper body to work in synch. Like all animals who achieve longevity in their environments, the “new” Ed seems to have adapted well to his niche. This article discusses the well known concept of contextual interference and how it can be used in golf practice. In this article, I will talk about how cricket coaches can use the same ideas in their own practise. Golf and cricket have always gone together and is often the favourite destination for cricketers on rained off days or after an unexpected early finish. Given that both sports are highly technical and require hitting a ball there is often an over focus on technique at the expense of just getting the job done. In terms of practice, there are often common features between the methods adopted in the two sports. Coaches talk about a ‘repeatable’ technique which can only be acquired through high levels of repetitive practice, or what cricket coaches term “volume”. While I would agree with the need to undertake lots of practice to get better; and that cricketers generally don’t hit enough balls, I would not support the way that this is currently undertaken. As the average 15 minute net session will involve facing approximately 30-40 balls of varying usefulness, there are few chances to practice specific shots due to the competitive nature of the net session and consequently, ‘technical’ practice tends to take place in one-on-one sessions with the coach and makes use of bowling machines, throw-downs or sidearms. In these sessions, coaches tend to focus on improving their players’ ‘weaknesses’ and will drill the specific shot until ‘practice makes perfect’. In the golf article, this is the equivalent of hitting a bucket of ‘3-irons’ in an attempt to make it better. This approach leads to good improvements in practice, however, poor ‘retention’ of the improved skill when it comes to using it in competition. How then should we encourage players to practice? Essentially, coaches should use variable practice or as I have said in previous articles, ‘repetition without repetition’ which means never repeating the exact same movement twice. Ideally this would also be against real bowlers who are asked to bowl specific deliveries (this is just as good as practice for the bowler). In practice, So, if a batter is looking to improve an off-drive, for example, the coach should ask the bowler to mix up his line while maintaining the same length, or keep the same line and change the length. The key point here, is that the batter needs to develop perception (the ability to pick the right ball to off-drive) at the same time as developing the hitting action (the off-drive). If a bowler is not available, the coach should either provide slow throw downs (from the full length of the pitch) or bowl downs from a little closer. While you might think these deliveries would be ‘too slow’, they are still more likely to result in the development of good co-ordination of the upper and lower body than would be achieved via underarms or drop feeds. If the coach wishes to use a bowling machine, it should be set at a slower speed and the batter can be asked to change his or her stance after every ball to ensure that the same shot is not played twice. In summary, if you are looking for short term improvements in confidence use blocked practice. If you are looking for longer term improvements use variable (repetition without repetition) practice, but remind the player that they won’t feel that they have improved as much during the practice session but will get better in the long run. This article by Ed Smith contains a number of gems for coaches. At the same time he provides us with windows into the theory behind skill learning and the implications for a more-hands-off coaching approach advocated by a constraint-led approach. Using quotes taken from the article, I discuss some of the key concepts highlighted by Ed Smith. Although coaches talk about developing a ‘repetitive action’, actually repeating exactly the same movement over and over is impossible to achieve. This was shown in the landmark work of Bernstein who is one of the grandfathers of modern thinking about skill acquisition. As you can see in the picture below, even a task as repetitive as hitting a metal sheet with a chisel is achieved via many different swing paths. 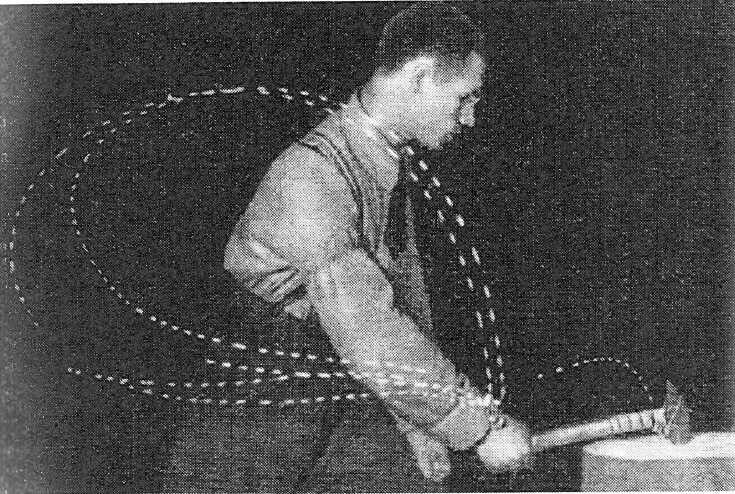 Repeating a task without being able to repeat the exact movements was described by Bernstein as Repetition without Repetition. It is crucial that coaches understand this concept when working with players; no two shot or ball deliveries are ever the same. In fact, the expert performer shows more variability than the less skilled. This variability is said to be functional and leads to great skill adaptability. Consider then cricket batting, if the player is encouraged to hit the ball with a full, uninhibited swing, the key to success is to simply time the swing of the bat with the arrival of the ball. 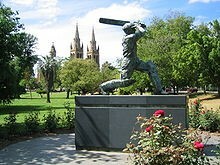 As part of my coaching I believe that the foundation for batting is developing a full bat swing (ala Bradman). Developing an uninhibited swing results in batters who can trust themselves to hit through the ball and not try to ‘control’ the path of the bat. Controlling bat swing leads to stilted and mechanistic movements, not the fluidity we associate with highly skilled players. Paradoxically, trying to control the bat often leads to more kinks in the swing. For example, the bottom hands chokes the bat and creates an in-to-out swing path that creates more problems. Once the batter is able to consistently hit the ball with a full backswing the coach can focus on developing control, by getting the player to vary the force they hit the ball by asking them to hit the ball to targets set at different distances. This approach is much more natural than starting with defence and then expecting to ‘build’ on it. According to the principle of self-organisation under constraints, coaching must be more hands-off than it would be under a traditional approach. Providing learners with opportunities to discover solutions rather than ‘prescribing’ answers is a basic tenet of constraints coaching. This approach creates a learning environment that facilitates exploratory behaviour and self-discovery via natural subconscious learning of movements rather than using explicit instructions that would encourage players to analyse their own internal movement. The key point then is that if we let it, the body will solve problems such as hitting a ball using subconscious control mechanisms. This means that coaching batting should simply be about providing opportunities for batter’s to learn to co-ordinate their movements to the flight of the ball. By setting broad outcome based goals (e.g., “hit the ball down the ground with a full bat swing” the player will learn naturally. Indeed, sometimes for the very young I have simply had them swing the bat back and forward across their body and I time my delivery so that the ball arrives at the right moment to facilitate good contact. After a few goes, and as they become more and more proficient they will then time their own swing to the ball’s flight. In sport, some coaches have intuitively understood that performers have the ability to self-organise. For example, Gallwey (1979) rejected the idea of teaching by providing explicit instructions to performers and developed strategies that ‘quietened the mind’ allowing ‘the body’ to solve the problem by self-organisation. He suggested that making ‘judgments’ after every go can get in the way of good learning and recommends just ‘noting’ what happened and then repeating the task without ‘trying’ to correct it. There is good evidence that this approach works as it allows the body to self-organise and come up with effective solutions. Incidentally, music can help quieten the mind and many great batters and bowlers have used this trick to quieten their inner voices. A failure to have a theoretical understanding of learning and the learning process can lead to coaching that “tinkers” at the edges. The key is to identify the core issue and then provide the environment to ‘guide’ discovery and allow batters to explore and discover the solution for themselves. In contrast, traditional coaching using explicit instructions and a focus on internal feedback is problematic because most basic movement patterns are under subconscious control. It is no surprise then that forcing learners to consciously think about what they are doing through providing explicit instructions and feedback will disrupt their performance and make it more difficult for them to automatise their skills (Beek, 2000). Traditionally, it has been said that a grade cricketer is only ever two great performances away from playing for Australia. However, can it be still said nowadays? In Australia, the changing international performance landscapes and the advent of professionalism (in what was a largely amateur sport where even Bradman went out to work before playing for South Australia) has led to a radical change in the structure of the sport. As highlighted above this new approach is providing cause for concern as a separation has occurred between performance levels and a Step-Wise Sequential Model has developed (Portus, 2010). For example, in the past, state and international cricket players regularly played in grade (club) competitions and this was viewed as one of the foundations of Australia’s success over the decades as players were only ever two short steps away from playing at the highest level. However, when the game went professional in the mid-90s, it has led to very little cross-over between levels; a situation that became even more challenging with the advent of centrally contracted players who rarely play state cricket, and almost never play club cricket. Creating opportunities for cricketers to compete against higher level opponents is important to help develop more skilled performers. Playing better players, means that players are pushed out of their comfort zones away from stable solutions and forced to adapt to more demanding performance environments. These phases can be challenging psychologically and lead to high levels of emotional variability. However, despite the importance in cricket talent development, the structure of the sport acts to limit the development opportunities for players. Opportunities for players to move out of their comfort zone is largely dependent on breaking into higher levels of competition, training with higher squads or perhaps occasionally playing against a high performing player who is playing at the lower level as part of his/her rehabilitation from injury. This traditional group-based approach which we have termed the Step-Wise Sequential Model creates a number of challenges in developing talent. Firstly, the difference in standard between performance levels means that selection is often based on guesswork as assessment of performance potential is often based on the whim of coaches who are all powerful (Christensen, 2009). In this sort of system the coach can be over reliant on statistical data or second hand evaluations when selecting (e.g., by the media). This may be more or less useful as it does not necessarily reveal data about the psychological attributes of the athlete. Secondly, lower initial performance levels would be predicted as the new player takes time to adapt to the increase in skill demands (perceptually, technically and in decision-making). Thirdly, promoted athlete may face a number of psychological barriers including being overawed or intimidated by playing against ‘stars’, low self-confidence and high levels of anxiety as the nagging question “am I good enough” rears its head until success is (hopefully) achieved. Fourth, selectors are likely to make more mistakes in selection as players are chosen who do not have the requisite qualities to succeed, Finally, because of the limited opportunity to compare players at different levels, players with the potential to be successful at higher levels may have to play for a long time before they get their chance at the higher level. This effect means that their performance can become too stable and they reach a plateau. Subsequently, when they do get their chance they struggle to adapt to the new demands. i. Provides opportunity to learn by playing with and against the best players. This would include off-field behaviours and preparation. ii. A number of players playing at two levels means that the step up for up and coming players is less severe as they have played against a selection of the ‘better’ players in the lower level competition. iii. The time required to adapt to the higher standard is likely to be shorter. iv. Promoted players may be more confident when promoted as they have played against (and most importantly had some success against) some of the players while at the lower level. v. Up and coming payers are less intimidated and not overawed by better players as they are more familiar with them. vi. There is a greater chance of selectors choosing the right players as their performance can be assessed when they play against players from the higher levels (in their current level). vii. Provides opportunity to move players up for a short period and then back down again…give them a taste of the requirements of the higher level. viii. If a player fails at the higher level it can be a good thing as they know they can go back to the lower level and work on the areas of need. ix. The greater movement between levels means that players can be given an early chance to be exposed to higher levels. a. Gives the player the opportunity to take risks without significant consequences: to create new adaptive solutions. c. It means that the better player has to become a team player and help the more junior partner. At appropriate moments this can involve protecting the player or giving them the chance to lead; act as a role model (in all aspects of performance); pass on knowledge that cannot be found in books. This back to the future concept for cricket may be the answer to Greg Chappell’s fears; but, putting it into place in the face of the over loaded international calendars may be more difficult. Renshaw, I., Davids, K., Phillips, E., & Kerherve, H. (2011). Developing talent in athletes as complex neurobiological systems. In J. Baker, S. Cobley & J. Schorer (Eds. ), Talent Identification and Development in Sport: International Perspectives. London: Routledge. This is an excellent article and a very worthy project that should be shared with all cricket coaches. Encouraging players to play other sports can only help them to develop the all round mental and physical skills needed to become a top cricketer. I know form experience that team mates and opponents who played any of the football codes were often far tougher opponents than those who had only played cricket. The type of sport also doesn’t matter: Graham Onions was an England U-18 badminton player. Sadly, the days of the dual international appear to have gone for ever. Wouldn’t it be wonderful if this project resulted in modern day Denis Compton’s, Jeff Wilson’s, Brisbane Grammar School legend Otto Nothling or another MJK Smith of England. The nearest comparison I can think of in more recent times is Rob Andrew and Simon Halliday who played in the 1991 rugby World cup Final for England and also scored first class centuries for their respective universities, while I.T Botham famously turned out for Scunthorpe United. When should we play the “Proper” Game? 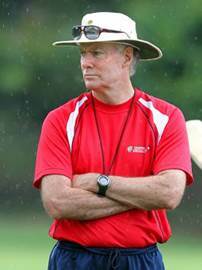 In his recent article on learning to bat before learning to bash, Greg Chappell provided some recommendations for introducing young cricketers to competition. However, what he highlighted presents an interesting challenge for junior cricket administrators and coach co-ordinators responsible for designing programmes that introduce the game to children. Given the increased aggressive marketing by a number of sports for the hearts and minds of young people, there is a view that children need to be put in ‘organised’ competitions as early as possible to ‘capture’ them for the sport. However, sadly, at present this results in the first experiences of cricket for many young children being one of failure and more than likely boredom due to the long periods of inactivity. For me, early experiences of cricket require the modification of games and activities to ensure that the basic skills can be acquired in fun environments. Bowling should be to graduated targets to give bowlers “points” for accuracy. Batting should be with controlled ‘bowled” feeds that put the ball in areas that are “hittable”, throwing should be at “big” targets and catching should be introduced with soft balls that don’t hurt when dropped. Games should be fast paced and made up of lots of goes. Essentially, Chappell emphasised that young children should not be playing ‘competitive’ cricket until they can play. That is until they are capable of ‘scoring runs’ and I would add until they can bowl relatively accurately. The key challenge for junior clubs and schools, is that many young players still do not have these skills by the early teenage years, so what do we do with these boys and girls? These children should be given opportunities to play in small-sided modified games where there are more gaps (as there are less fielders) to hit the ball into. In fact, I was struck by watching a 13 year old boy having a great time in a 8 v 8 game in the last training session of the season who I over heard saying to his batting partner “this is the first time I have scored runs all season.” We have to be smarter and modify games to meet the needs of the children. By doing this we will create a deeper engagement with the game and meet the goals of the sporting administrators at the same time. Key message to parents: be patient, there is no rush to play ‘proper’ cricket. Additionally. you can speed up the readiness for competition with backyard games and activities (I have given some suggestions in earlier posts). This short video clip shows “Jamie” playing table tennis with his dad. For me, this summarises the first stage in learning in a bat-ball sport and is all about providing opportunities to learn to time bat swings to ball flight. In terms of a constraint-led approach, Jamie is learning to couple perception (ball flight) to action (bat swing). My question then, i to ask if there any other ways of developing perception and action than simply providing balls (for Jamie) to hit and what are the implications of this for learning to bat in cricket? In terms of batting, it seems that learning to bat by facing bowlers is seen as too hard. Cricket coaching has advocated ‘simplifying’ batting by placing balls on tees, or using drop feeds to develop ‘technique’ in isolation to the need to ‘time’ the swing to the ball flight. As you can imagine, I am strongly opposed to these strategies and believe they simply do not work. So, what is the cricketing equivalent of multi-ball? Must be learnt and contrary to popular opinion, it can’t be taught. The early exposure to the art is critical in the development process. Too much instruction in the formative stage can be deleterious to development. So, in terms of developing batting skills I would argue that the advice I was given by veteran Yorkshire coach, Ralph Middlebrook the day after my son was born is still spot on. Ralph said: ‘Do me a favour, Ian…bowl at him from day one, as he needs to learn to couple this (he mimicked the bowling action) to this (mimicking a batting action)”. For me, this made perfect sense, theoretically and practically. Thus, my batting multi-ball was via a basket of tennis balls placed on a stool at the top of the driveway. These balls were bowled at the young batter standing in front of the ‘stumps’ (the front door or the house). I ‘bowled’ the ball to land short or full, with the only instruction being to hit the garage wall (square leg) or step forward and hit it back over my head to land on the garden on the opposite side of the road…(a straight drive). 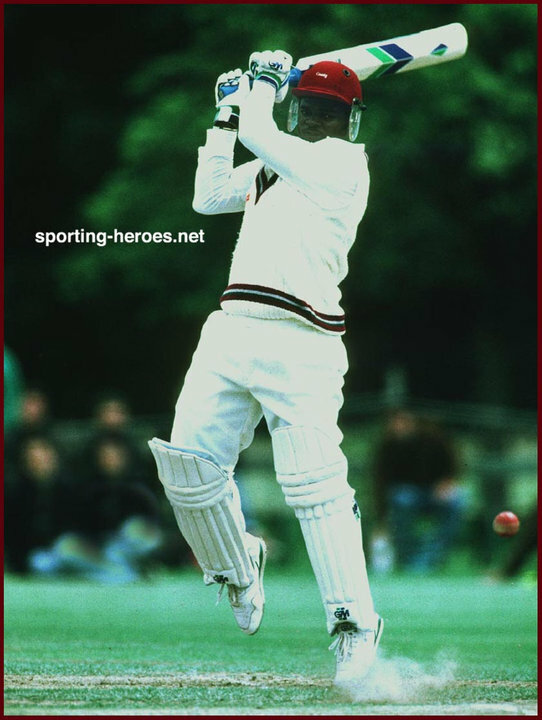 Through this approach, the young batter was able to couple his actions to the ball flight and was easily able to pick length when he started playing in organised cricket at 7 years old.